The exhibition Final Sale. 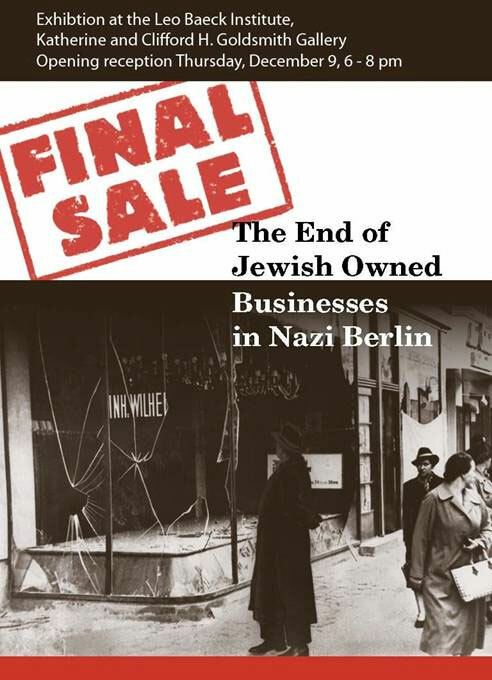 The End of Jewish Owned Businesses in Nazi Berlin documents the process by which Jews in Germany were disenfranchised and their livelihoods destroyed through the examples of 16 Berlin businesses, but that is only half the story. The exhibit also demonstrates the flourishing of Jewish entrepreneurship in Berlin before 1933, when the city was a center of Jewish life as well as the hub of the German economy. Researched by staff and students at the Department of Modern German History at Berlin’s Humboldt University and produced in conjunction with the historical society Aktives Museum Faschismus und Widerstand in Berlin, e.V., the exhibition received critical praise during its showing in Berlin and is now on display for the first time in the United States. In addition to the 16 biographical stories of Jewish entrepreneurs in Berlin, the exhibit includes a database of over 8,000 Jewish-owned businesses, which can be searched on a public computer terminal. This is the first time this data has ever been available to the public. In the early 1930’s, Jewish Germans operated a large share of many of the most successful and innovative business in Berlin. From E. Braun & Co., considered the first boutique, to Max Reinhardt, the owner of Berlin’s most prestigious theater, to Else Ernestine Neuländer, proprietor of an in-demand photo studio, these entrepreneurs were forced out of business through a mix of discriminatory policies and physical intimidation that culminated in the destruction of thousands of Jewish-owned businesses on November 9, 1938. This exhibit documents the success of these businesses before 1933, their resistance and struggle to survive, and the eventual “Aryanization” or liquidation of all Jewish-owned businesses. The Leo Baeck Institute is proud to present Final Sale for the first time in the United States from December 9, to March 31 at the Katherine and Clifford H. Goldsmith Gallery.